When someone provides an excellent foundation for something to be blueprinted and creatively modified, amazing things can happen. I now have a FAR greater appreciation of a 1977 Ford F-150! The engine for this truck came from the Ford GT. It is pretty impressive from the factory. 647 horsepower.........and it's a V6! However, when there's a good foundation for people to get creative, and they are able to modify it...........this truck now has 914 horsepower. Can you imagine if they actually used the Turbo Ford V8 that they put in a Mustang?! With over 1400 horsepower?! Turbo Fords that are blueprinted and creatively modified, along with a talented driver, sure do look hard to beat! The video isn't long, I hope y'all like it. P.S. Bill Calfee, if you read this, I recall you once posted about a hotrod Ford truck you had. I think you said you built it with so much torque it took a log chain and a mule to hold the engine to the mounts. If I recall right, you had audio of the truck running while you were talking. That thing sounded MEAN! What year was that truck and what did you do to it to make it sound so good? I doubt that anyone wants to hear about BC's hot rod days. And yes, that thing had so much torque that I had to resort to an ole truck pullers trick, I chained the motor to the frame on the drivers side. 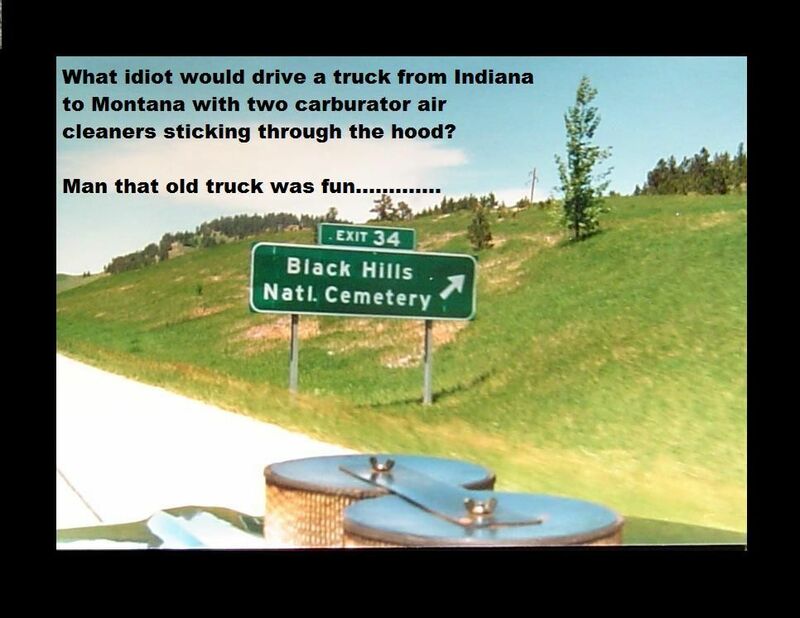 I'm sure IHMSA80x80 remembers that truck, cause I drove it to Pennsylvania for the 1989, NRA Pistol Silhouette Nationals. But nothing compares to the sound of a long duration cam in a big block Ford engine, especially at idle. The Ford firing order is different, which gives it that killer sound at idle. A long duration cam in a big block Ford sounds like the right bank of cylinders is fighting the left bank to see who's king. 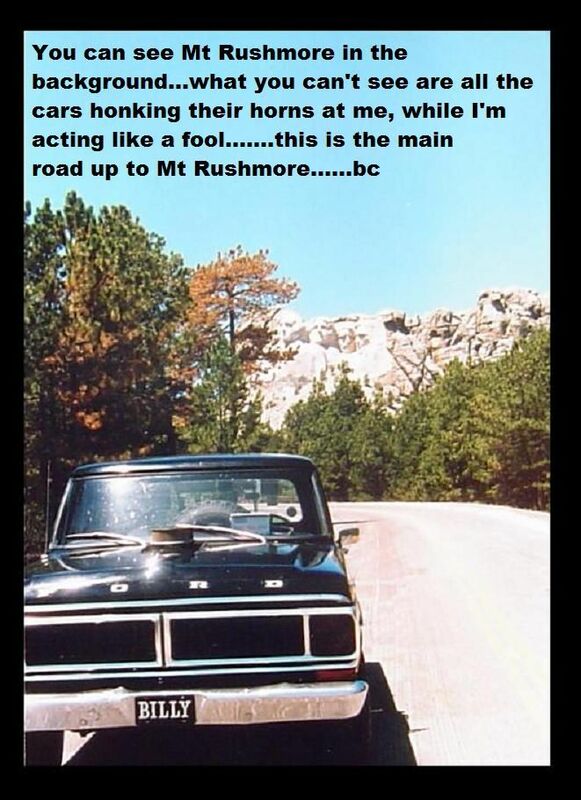 Man that old truck sounded bad. Greg, I'll try to dig up some pictures. Last edited by Bill Calfee; 4 Weeks Ago at 07:32 AM. Cool! Please do that, Bill. I've always loved the sound of big blocks, but I have never had one. I had a turbo car once and could immediately see the benefits of a turbo. Had best intentions to do a lot of work upgrading it, but my back wouldn't permit it. A guy I knew who was very up to date on turbo cars told me what I needed to do to outrun the best Corvette at the time, but I never got to do it. What that little car could do in curves was amazing. That's what got me hooked on stuff like that. Here is a big block Turbo Ford Mustang............with 1400 horsepower. Turbo Fords can be amazing! This driver is amazing too. I was always a Chevy guy for the most part, but I can see how these new Turbo Ford's can do things even Corvettes can't. Man alive I wish I could drive like that! Please post what you can about your Ford truck. I still recall the rumble of that thing in the audio........and it sounded MEAN! Back in the 80's I drove that old truck to a bunch of rimfire matches around the country......so I guess it's part of rimfire shooting. But, I wanted it reliable, and, I wanted it to be able to use regular gas. I used a 3-1/2 inch stroke crank in a .050" over 352 block. I found a set of large chamber heads, from a 428, I believe......so the compression would allow me to use regular gas. By the way, the carb linkage was not progressive......the primaries on both carbs opened at the same time. The cam was from Comp Cams.........it was ground on a 112 degree center line, I believe, and had .610" lift on both valves and 306 degrees duration. It also had Comp springs, light weight retainers and locks. It had 226,000 miles on it, now get this......it still has, to this day, the original transmission, rear end and the original universal joints. My son still has it. Here I'm headed to Custer's Battle Field in Montana. 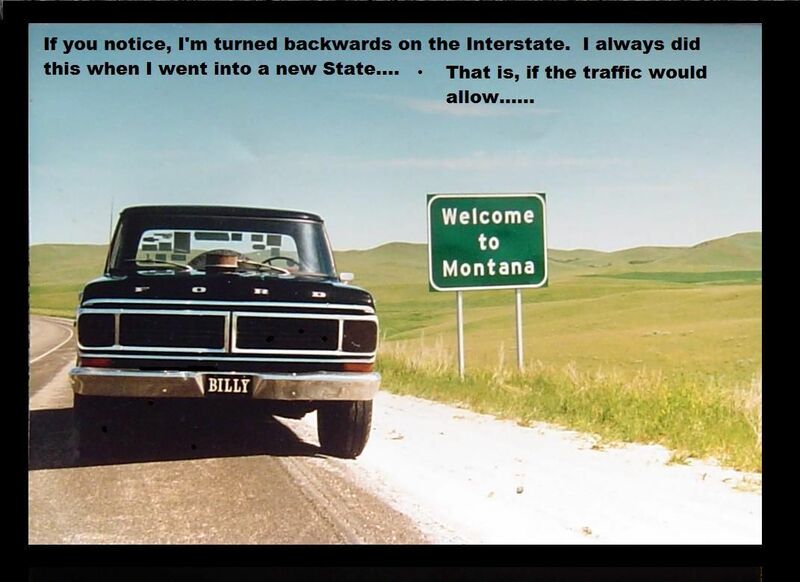 When I went into a new State for the first time, if traffic allowed, I'd always turn the old truck around on the Interstate so I could see the front in my picture. It looks like I'm all alone on the road, but that wasn't the case......cars were honking their horns at some idiot standing in front of his old truck taking pictures..
By the way, if you look closely you can see a radio/tape recorder sitting on the dash in front of the steering wheel..
Last edited by Bill Calfee; 4 Weeks Ago at 02:14 PM. I well remember that cool truck. It sounded like it meant business! The man that owned the garage of the first place I worked loved FE's. He had several in pickups,two dump trucks and a lime spreader. I always dreaded having to pull those huge cast iron intake manifold. His favorite was the 352 or the 390. Im sure you was creative with jetting with manual linkage and driving alot. Good story Mr. Calfee. Brought back memories I hadnt thought of in a while. I like that grille. That is a cool truck and doubly cool that your son still has it. I seem to remember a video you posted of it running and it sounded a lot like a Modified running caution flag laps--the best sound in motorsports in my opinion. I did not know what you meant by FE's. I had to look it up. Wow! Ford Edsel! While I have always liked a few Ford's, I was more of a Chevy guy. I had NO idea about the FE engines! Years ago I talked to a guy who was building a nine second Pinto. I said "why in the world would you do that?". He said "because the world NEEDS a nine second Pinto!". It would not surprise me if he used one of those FE engines. This has been nearly 20 years ago. He showed me the pics of where he was tubbing the car out. It was surprising. Hope he finished it. There are all sorts of Turbo Fords driven by Ken Block. Videos of them are pretty cool. I looked around and found all sorts of other Fords getting turbo'd. Even Mavericks and Granadas. The Granada wasn't my thing, but it has well over 1,000 horsepower. Just a testament to creativity, I guess. The Fiesta in the video I linked has something like 650 horsepower with a 4 cylinder and does 0-60 in 1.8 seconds. The F150 and the Mustangs Ken Block has are my favorites though. I had an Uncle who passed away a few years ago. He bought numerous barn and field finds in Eastern Kentucky when I was a teenager. Had best of intentions of restoring them. Never happened on most of them. One I always thought was cool was the 1962 Ford Galaxie 500 Sunliner convertible. It had 70,000 or so miles on it when he drove it into my Mamaw's barn and parked it when I was 16. The body and interior were in VERY good shape. The exhaust was no longer on it, so that 390 made quite an impression on me as a teenager. Man.........I wanted that car. He bought a 4 door '64 model for spare parts. He sent some cash and the cars to a guy to restore the convertible. The cash disappeared and the car never got restored. I am more than a little curious what my Uncle said to the guy. That Uncle had a wild side, even as an old man. I saw the car for the last time after my Uncle died. I was stunned to see it had been kept outside and was nowhere near what it was when I was a kid. Pity. Thanks for mentioning FE engines, it was fascinating to read about some of the historic engines built on that platform. Last edited by 404tbang; 4 Weeks Ago at 05:46 PM. Thanks for posting those pics and telling the stories! I'm astounded at revving that to 8,000 rpm! Had to have been a neck snapper! I'm also astounded that you had 226,000 miles on it when you gave it to your son, and that so much of the original parts stood up to that engine! I can only imagine how tickled your son was to get that. 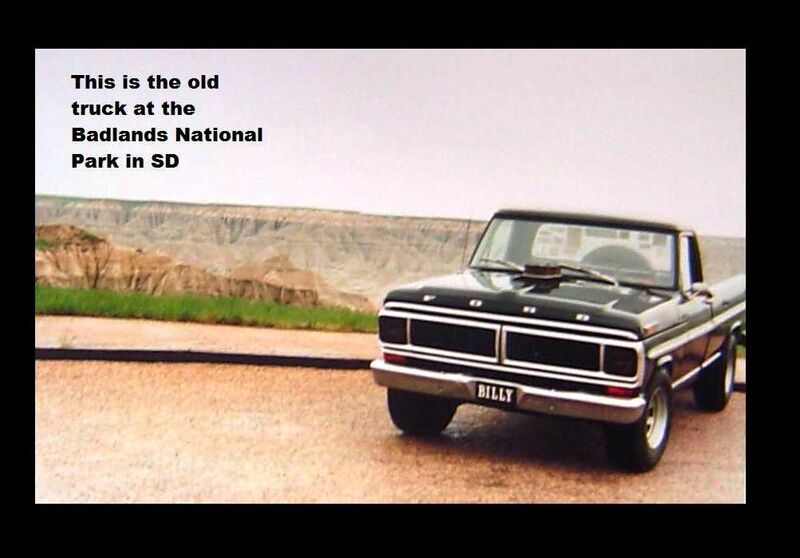 That last pic, at Badlands National Park is particularly cool. That truck has good lines. I hope you had a blast driving it, and I hope the same for your son. Thanks for putting up with me and posting about your truck! Greg, when I've had a bad day, a lot of times I will go home and watch videos of Democrats reactions to Trump winning and ken Block driving. Both make me smile.